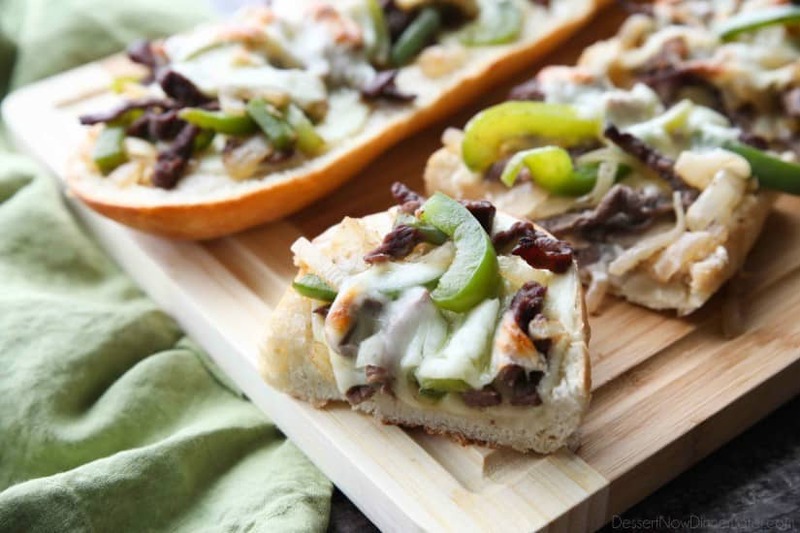 Philly Cheesesteak French Bread - Dessert Now, Dinner Later! 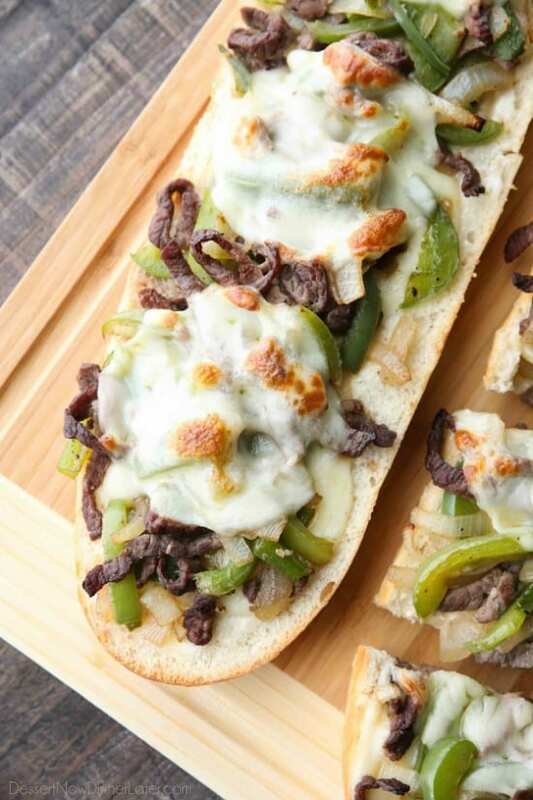 Philly Cheesesteak French Bread is a delicious open-faced sandwich with plenty of juicy meat, crisp veggies, and melty cheese for an easy dinner that is sure to satisfy! I have been stuck in a dinner rut. I feel like we fix the same meals all the time, and I’m just not in the mood to make dinner, like ever, haha. Mostly because when the kids get home from school it’s “go time” to feed the dog, help with homework, and cook dinner before my husband gets home. It’s madness I tell you! My kids are picky little eaters too which makes dinner that much more of an uphill battle. So, I’ve determined to make a few meals that I know the kids will like, and a few meals that I know my husband and I will like each week. 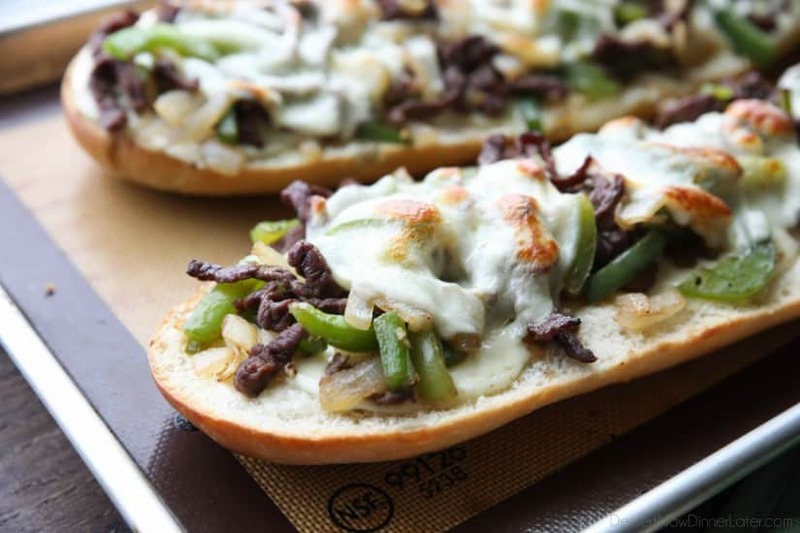 Crazy enough, this Philly Cheesesteak French Bread is actually one meal everyone is okay with. 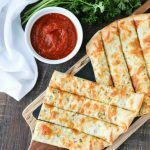 My kids would prefer no veggies, but they ate it anyway and liked it for the most part. I’m a huge fan of fresh baked bread whenever I can have it. It just tastes a million times better! So I keep Rhodes loaves in my freezer for pizza dough and French bread, which is what I baked for this recipe. I put the frozen loaf of bread in the fridge to thaw overnight covered with sprayed plastic wrap. Then take it out of the fridge in the morning, roll it into a longer loaf and re-cover it with sprayed plastic wrap. Let it rise at room temperature, cut some slits on top with a serrated knife, and bake it fresh to use for dinner that night. This bread does not even compare to the cheap loaves of ready-made French bread at the store. 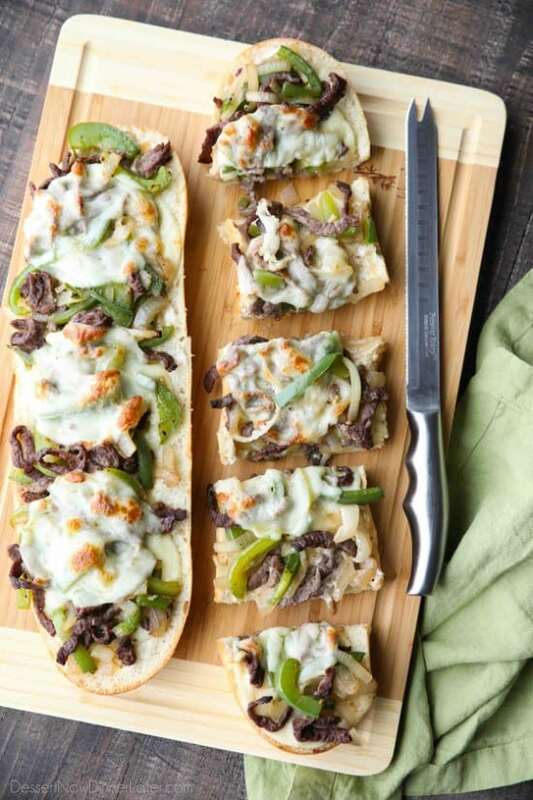 For this Philly Cheesesteak French Bread, you cook up the meat and veggies separately, then combine them together. 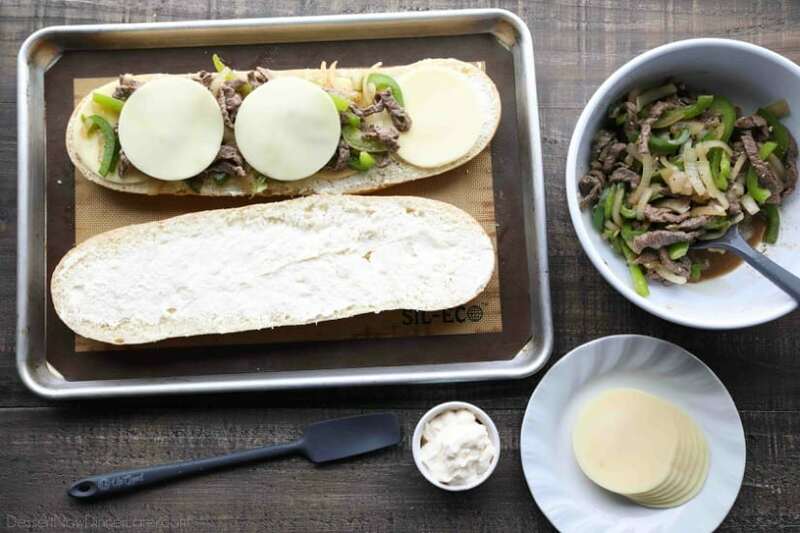 Cut the French bread in half, spread some mayonnaise on the inside of both halves, layer with cheese, meats and veggies, then more cheese, and bake! The hardest part is cutting the meat and veggies in preparation for this meal, and honestly, that’s not very difficult. 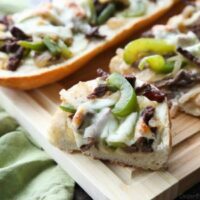 I really loved this loaded Philly Cheesesteak French Bread! It’s flavorful, crunchy, and tender in all the right places. 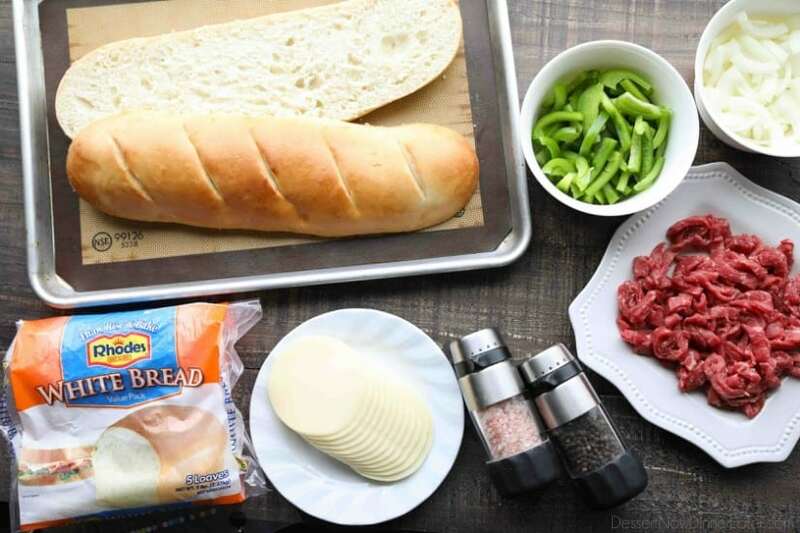 This meal is pretty quick to put together if you bake the bread ahead of time. Plus, it’s a pretty balanced meal with grains, protein, vegetables, and dairy. (Mom win right there!) I can’t wait to have it again! Heat a large skillet over medium-high heat. Generously season beef strips with salt and pepper. Add 1 Tbsp of oil to the hot skillet. Then add meat to the hot oil and sear, cooking for 2 minutes. Add the garlic and Worcestershire sauce THE LAST 30 SECONDS. 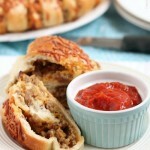 Remove meat from pan into a large bowl or plate and set aside. Return skillet to stovetop. Add 1 Tbsp of oil to the hot skillet. Add vegetables, season with salt and pepper, and cook about 5 minutes, stirring occasionally, until starting to soften. 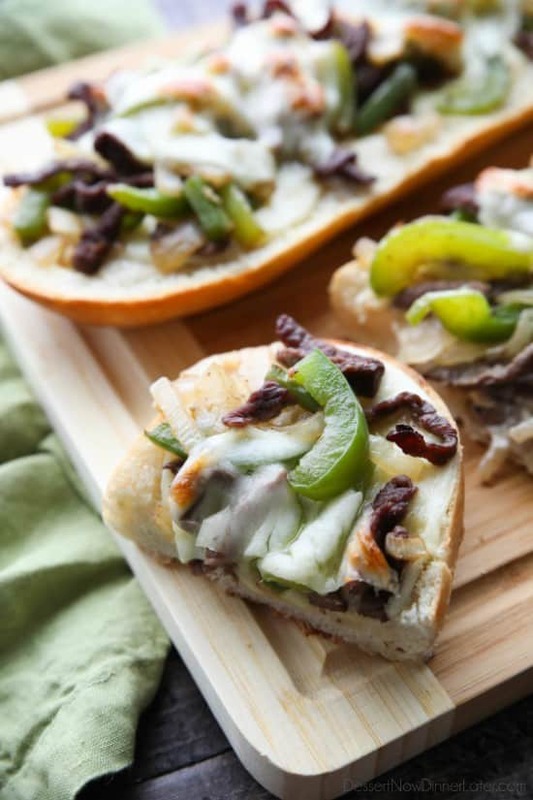 Remove vegetables from pan and toss with meat. Cut French bread in half width-wise. Spread mayonnaise on the inside of both halves. 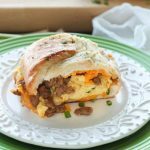 Layer with three pieces of cheese on each half. Divide meat and veggie mixture on top of the cheese. (Try not to drench the bread with any juices.) Top both halves with 3 more pieces of cheese each. 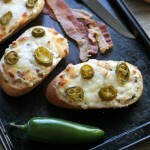 Bake at 400 degrees Fahrenheit for 10-15 minutes or until the cheese melts and starts to brown. Slice and serve immediately.